Add cashew nuts, fry till slight golden brown. Add raisins, saute till it puff. Add vermicelli, saute till golden brown. Note: I have used roasted brown vermicelli. If you are using the same sauté for 6-7 seconds. Add milk & almond powder, bring to boil. Add sugar, condensed milk & cardamom powder. Mix well. 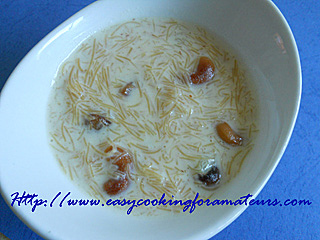 Vermicelli pudding/ Siveyan Kheer is ready to serve. Yum! I'd like to gobble it! Yours looks tempting and mouthwatering...! my all time fav...irresistible clicks...yum yum! Yummy! Pass me that bowl please..
One kheer I never get tired of :-) Happy New year !! Thank sounds really interesting. My kids would go crazy for it. this is my all time fav.. looks lovely.. can have it anytime! Love this one of my fav desserts.